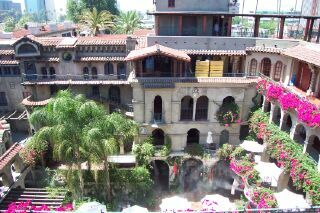 We went back to Riverside and the Mission inn. I wanted to wander around where they didn't take us on the tour and get some more photos. They wouldn't let us take pictures on the tour. 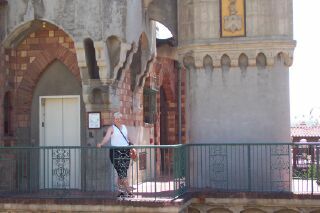 The Chapel here is supposed to be quite spectacular but I have yet to get in. On this day like the last time there was a wedding going on. In the back here you can see the entrance to the Chapel. 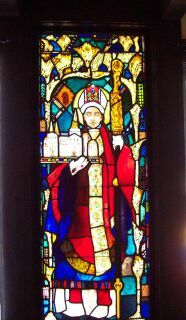 One of many stained glass windows in the Inn. 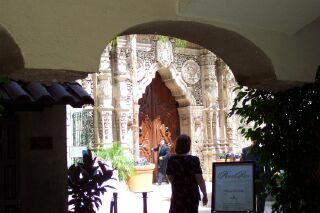 In this one the saint is holding the Mission Inn in his hand. The top floor of this place is quite spectacular. Neat little places to wander around and sit and enjoy the cool evening air. In the middle of the day it gets pretty hot in Riverside. Again it was probably 100 degrees the day we were there. 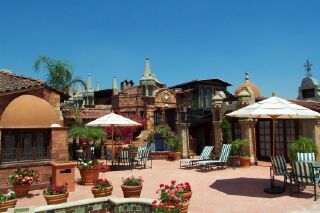 Here is a view looking down at the main courtyard. Note the misters going down below. They really do cool things off about 10 degrees.